The exterior mirrors reduce the size of the image. Objects are actually closer than they appear. You could misjudge the distance from vehicles driving behind and cause an accident, e.g. when changing lane. For this reason, make sure of the actual distance from the vehicle driving behind by glancing over your shoulder. ► Make sure that the SmartKey is in position 1 or 2 in the ignition lock. ► Press button 2 to select the right-hand exterior mirror. 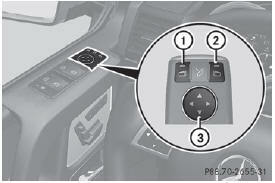 ► Press button 3 up, down, or to the left or right until you have adjusted the exterior mirror to the correct position. You should have a good overview of traffic conditions. The exterior mirrors are automatically heated if the rear window defroster is switched on and the outside temperature is low. ► Briefly press button 1. If you are driving faster than 9 mph (15 km/h), you can no longer fold in the exterior mirrors. 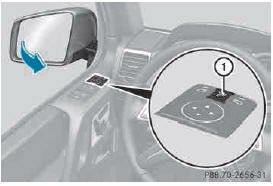 ► Make sure that the SmartKey is in position 1 in the ignition lock. ► Press button 1 repeatedly until you hear the mirror engage in position.